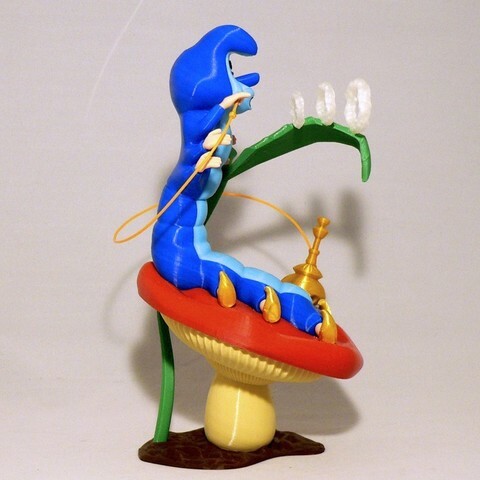 The Caterpillar, a character from Lewis Carroll's Alice's Adventures in Wonderland. 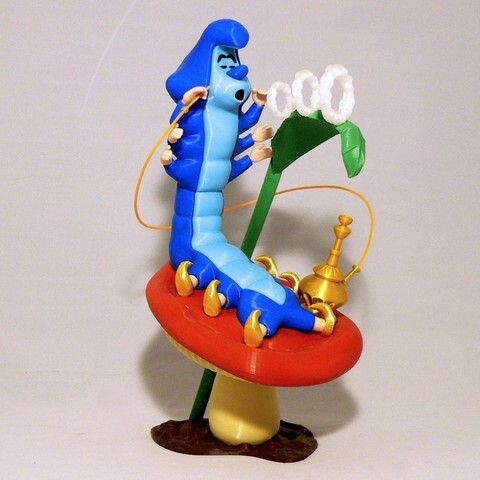 The Caterpillar is a hookah-smoking caterpillar. Alice does not like the Caterpillar when they first meet, because he does not immediately talk to her and when he does, it is usually in short, rather rude sentences. 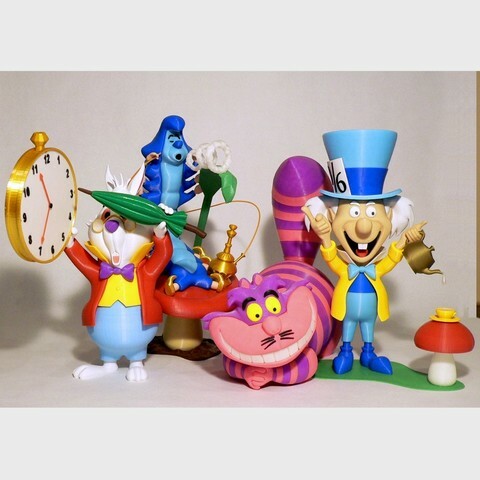 His memorable phrase is a breathy "Whooo ... are ... you?" The assembled model is 290mm tall. Enjoy, and be ready to answer when someone asks "who are you?" 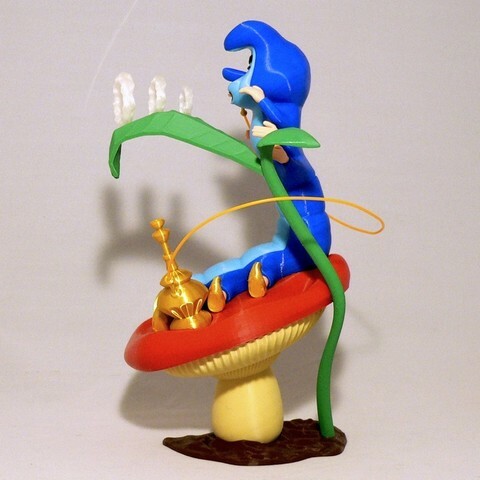 2-Use your judgement for brims/rafts on the hands, legs and hookah_mouth pieces due to the smallish bases. Also, the body_top_in and body_top_out pieces are tall with reasonable bases but you may want to consider a brim depending on your bed adhesion. 3-The parts should fit nicely when printed cleanly or with a slight first layer squish. A reminder, first layer cleanup also applies to the inside edges of parts. Holes for pins that are on the print surface should be clean of first layer squish. 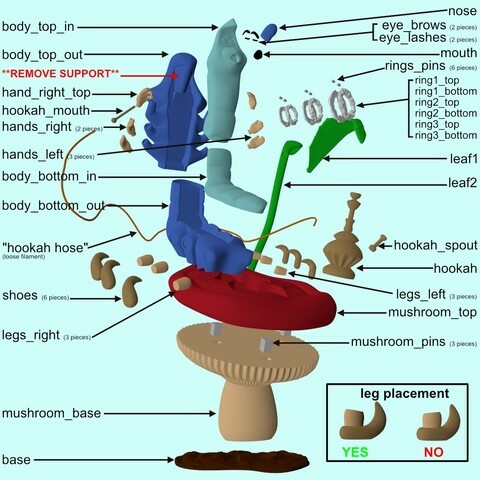 The hookah_mouth also has a hole in the base for the hookah hose that needs to be clean. 4-The body_top_out contains a built in support resting cleanly on the part. The support was tested with a .4mm nozzle and .2mm layer height. When it was removed, I needed absolutely no cleanup. If anyone has an issue with this, I will release the part without the built in support. 1-I used both E6000 craft glue and thick superglue to put this model together. 2-The eye_lashes are quite small and can be glued to the dent provided, as long as they are positioned properly they do not need to be fully inserted. 3-The left/right legs are slightly different but if they get mixed up they should still fit. **Important, be sure to note the correct position of the legs to the shoes as noted in the diagram. 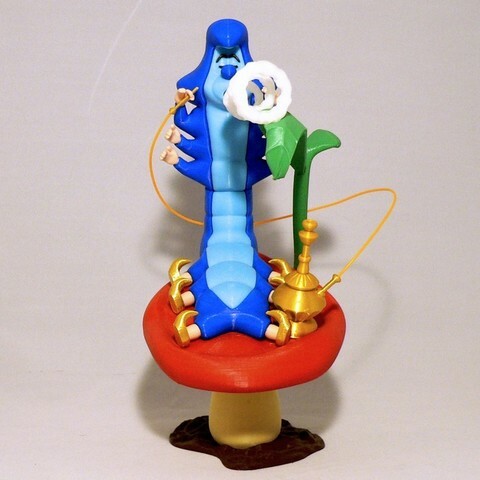 I glued the body of the caterpillar to the mushroom before attaching the completed legs/shoes. 4-leaf1 and leaf2 should be glued together. Once the mushroom and base are completed, the leaf combination can then be inserted into the base and rest against the notch in the mushroom_top. 5-I've included some tiny aligning pins for each of the smoke rings. Take the time to join the two halves of each ring properly. The transparent filament makes it quite difficult to see what you are doing. Each ring has a small flat side extrusion in it for insertion to leaf1. All three rings are basically identical, so work with the larger one first and then rotate and position the other ones exactly the same. The rings should cleanly fit into the leaf for gluing and line up. 6-For the hookah hose, I used 450mm of ABS filament right off the roll. 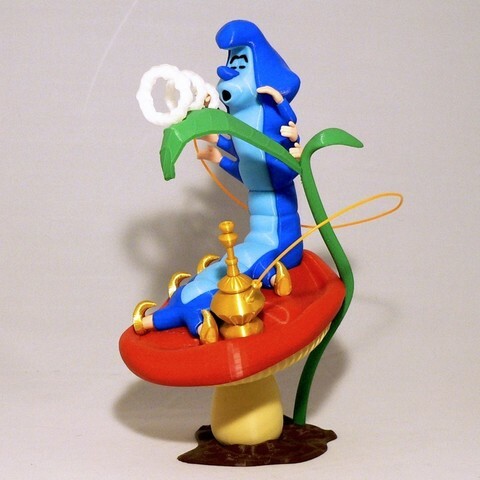 The hookah_mouth and hookah_spout have dents to accept 1.75mm filament. If I get any requests for a different size, I'll release the parts. 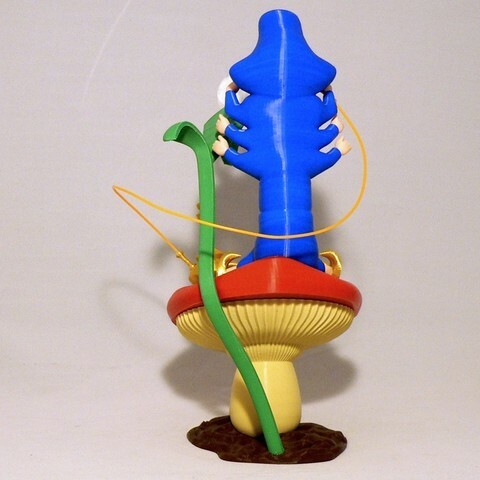 For a more 'natural' look, you can use a heat gun/hair dryer to soften the filament as you curve it around the model. 7-Refer to the assembly diagram as well as the uploaded pictures for putting the model together. The model is meant to be glued. Thank you! and don't forget to post pictures of any makes of my models. Seeing pictures gives me the incentive to make nore models.